St. Isidore was born in Madrid, Spain, in the latter half of the 12th century. For the greater part of his life, he was employed as a laborer on a farm outside the city. Many marvelous happenings accompanied his life-long work in the fields and continued long after his holy death. He was favored with celestial visions and, it is said, the angels sometimes helped him in his work in the fields. St. Isidore was canonized in 1622. In 1947, he was proclaimed the patron of the National Rural Conference in the United States. He is the patron of farmers, and his feast day is May 15th. 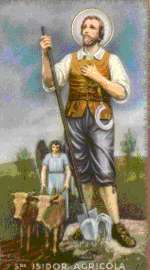 God, through the intercession of St. Isidore, the holy farmer, grant that we may overcome all feelings of pride. May we always serve You with that humility which pleases You, through his merits and example. St. Isidore, pray for us.